We strive to create every aspect of the programme with our users in mind. Feedback is central to this process; we believe our partners are in the best position to provide useful, constructive feedback to ensure continued improvement and relevance. We further promote this strategy in our workshop materials, encouraging our partners to consider their stakeholders' experiences when applying their new skills on the ground. We push to meet the need diverse needs of our global partners. By delivering the workshops online, we are able to reach more organisations and reduce barriers in access to training. We also believe that access means time and space available for learning; we work directly with decision-makers to gain their buy-in to ensure workshop participants feel encouraged and supported as they learn and practice new skills. Learning occurs in myriad ways, but social learning, or learning from our peers and mentors, is a great way to build and practice new skills sets. All workshops are completed with the support of a trained facilitator and within teams where individuals receive constructive feedback, personalised support, and participate in stimulating discussions. There is no better way to learn than to do. We orient all of our learning materials to be directly applied to our partner's current work so that they are learning and reinforcing new skills, all while producing tangible outputs and making progress towards completing work-related tasks. With an overwhelming amount of learning resources now available on the Internet, it is sometimes hard to get what you need, when you need it. We endeavor to reach our partners when the training is needed by focusing on their needs and priorities. 1. Who is eligible to participate in a Data for Action workshop? All CIVICUS member organisations are eligible to apply to participate in any of the Data for Action workshops. 2. Can I become a CIVICUS member? 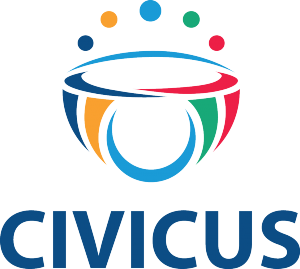 Yes, CIVICUS membership is open to all individuals and civil society organisations committed to its goals. Membership is free and the application can be completed online. Visit our membership page to learn more. 3. When will the next workshop happen? Our workshops begin at a variety of times. Get in touch or send in an application for more details. 4. How many individuals from my organisation may participate the workshop? We allow a minimum of three full-time staff and a maximum of six full-time staff to participate from one organisation at a time. There is currently no cost to the organisation to participate in any of the workshops. 6. What time will the workshop be held? Currently, we can accept organisations between the UTC+7 and UTC+3 time zones. 7. What is the expected time commitment? Most of our workshops are intensive. Expect to spend around four hours a day in a combination of discussions, watching videos, activities and facilitator feedback. We have workshops available, although not always available, that range from 1 day to 10days in duration. 8. Can an intern participate? We request the participation of at least three full-time staff. Up to three interns may participate in addition to the full-time staff but not in place of the full-time staff. 9. What is the language requirement? We are only conducting the pilot in English. However, if the pilot is successful, we will be expanding to Spanish, French and Arabic. Please get in touch using our contact form!